Laurie Koehler, the vice provost for enrollment management and retention, said officials are revisiting housing assignments and adding course sections to accommodate the roughly 2,800 students in the Class of 2022. Roughly 2,800 students will make up the Class of 2022, representing the largest freshman class since at least 2008. Officials said more first-year students committed to GW this spring than anticipated – an unexpected uptick in the University’s long-declining yield rate, the ratio of enrolled students to the number accepted. Officials said they will make several administrative changes to accommodate the class, including cutting down on transfer admissions, adding class sections and reconfiguring housing assignments. The University typically enrolls about 2,500 students in its freshman class every year, with 2,610 students comprising the Class of 2021, according to institutional data. 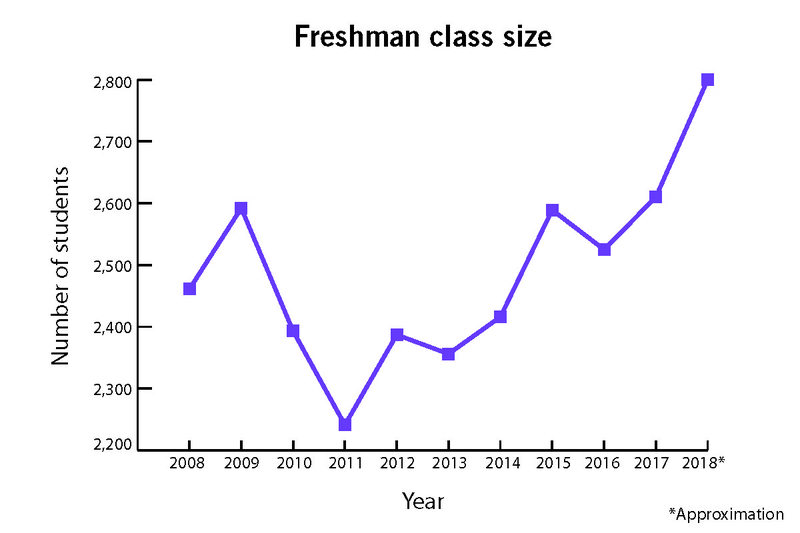 The roughly 200-student increase in freshman class size between 2017 and 2018 represents a more than 7 percent jump – likely the highest one-year increase in more than a decade. “This year, while we only admitted about 30-35 more first-year applicants than last year, we yielded first-year students at a rate higher than we have in the recent past,” Laurie Koehler, the vice provost for enrollment management and retention, said in an email. The University’s yield rate has dwindled since 2012, falling to a record-low 23.6 percent last year, down from 24.6 percent in 2016, according to institutional data. While final enrollment numbers won’t be released until the fall, the roughly 2,800 figure approximates GW’s yield rate at just more than 25 percent this year. Officials admitted about 11,100 students to the Class of 2022. The increased yield also allowed the University to avoid admitting students from its waitlist for the first time in at least nine years. To accommodate the increased class size, Koehler said officials are being “more selective” with transfer admissions and anticipate that about 150 transfer students will enroll this fall. Since 2013, about 270 students have transferred into the five main undergraduate schools annually, University spokeswoman Maralee Csellar said. The University aims to enroll between 2,825 and 2,925 first-year and transfer students every year “to meet our various enrollment objectives, including net revenue,” Koehler said. She said officials are also re-evaluating other aspects of campus life – including housing assignments and the schedule of classes – to prepare for the Class of 2022. Higher education experts said the increased yield rate could indicate that admitted students perceive they will enter a university that prioritizes student satisfaction. David Montesano, a college admissions strategist at the education consulting firm College Match, said officials have marketed a positive student experience to prospective students this application cycle because University President Thomas LeBlanc has placed an increased focus on improving campus culture during his first year in office. 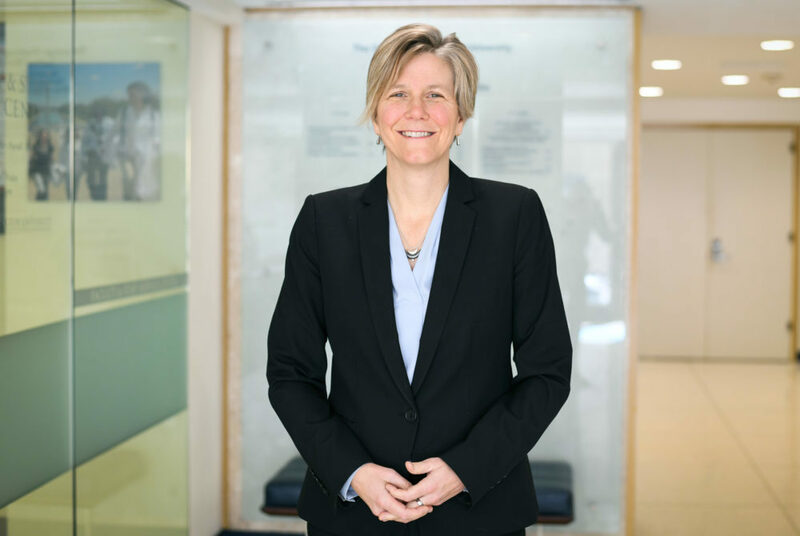 Since arriving at GW in August, LeBlanc has approved an increase in dining dollars, an overhaul of the Colonial Health Center and a merger of the student affairs and enrollment divisions in the name of enhancing campus culture. Montesano said a jump in enrollment likely indicates that the marketing has been successful. “They spend a lot of time focusing on marketing and promoting a better student experience – those two things are coming together,” Montesano said. Steve Goodman, an educational consultant and admissions strategist for the Education Writers Association, said the enrollment increase could also produce more long-term donors for the University. He said because a heightened number of students will likely stay at GW for four years – instead of the two or three that transfers spend at the University – they will feel more connected to the school and be more inclined to donate later in life.